Over the weekend while I was sick, I was glued on watching CNN. 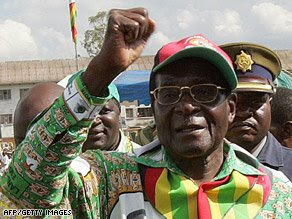 They featured the current election in Zimbabwe were the incumbent President Robert Mugabe is running. If I am not mistaken President Robert Mugabe ruled for over 20 years already. His reign started from 1980 when he was still the Prime Minister then became the President on 1987 till the present. With the current situation of Zimbabwe were there are no food, jobs and their economy is continuously sinking, I think the incumbent President Mugabe should be replaced. With corruption allegations and mismanagement of the government finances, the only good thing to this country is a big change in governance. If people power is needed then they must do it. Would you believe that Zimbabwean are leaving their country even to buy food? They would even try their luck in crossing the river full of crocodiles just to reach the border of Zimbabwe’s neighboring country. From the last news update from CNN, counting of votes hasn’t been disclosed yet. 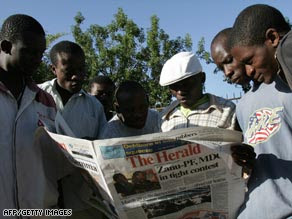 And there are news that the incumbent President Mugabe has rigged the votes. There is still hope for Zimbabwe if public officials would be selfless and would just think about their fellowmen and not to enrich themselves. he is tied to killings diba? oh well, in every country there is always a bully.. they make change faster naman on lighter side..